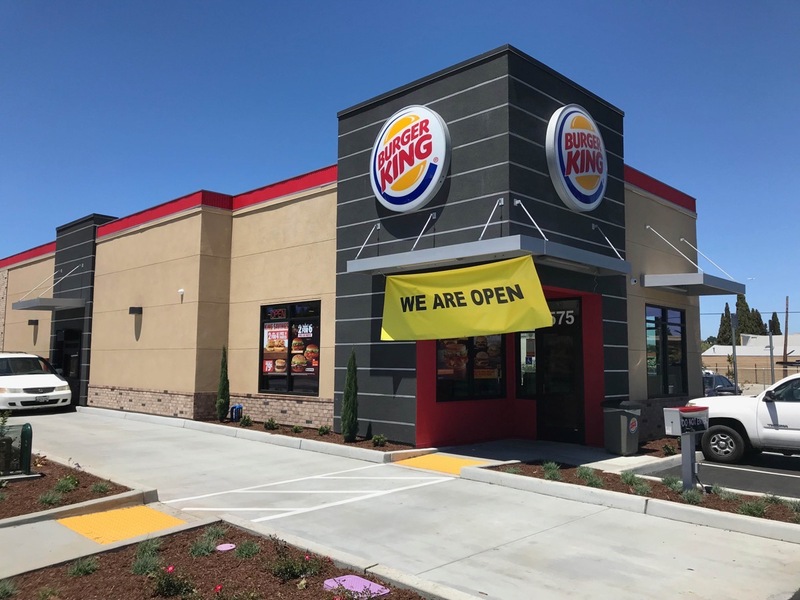 The new Burger King is not only smaller, it is oriented differently on the property and seems clearly intended to focus more on the drive-thru part of the operation than before. 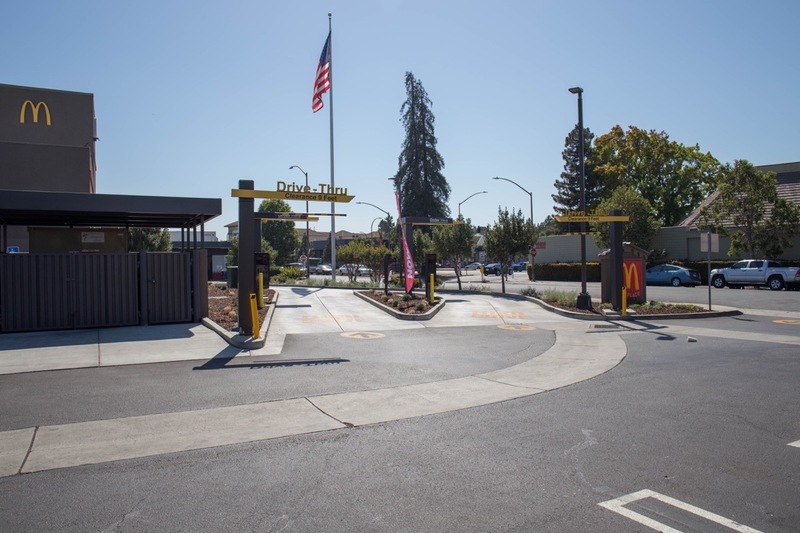 As you can see in the above picture, accessing the main entry doors from El Camino Real requires the pedestrian to cross the drive-thru lane, sending a subliminal signal that they’d rather you just used the drive-thru (there is a door in the rear that doesn’t require crossing the drive-thru). The previous building, which was built many years ago, had a much larger dining room and a rather tight drive-thru lane. 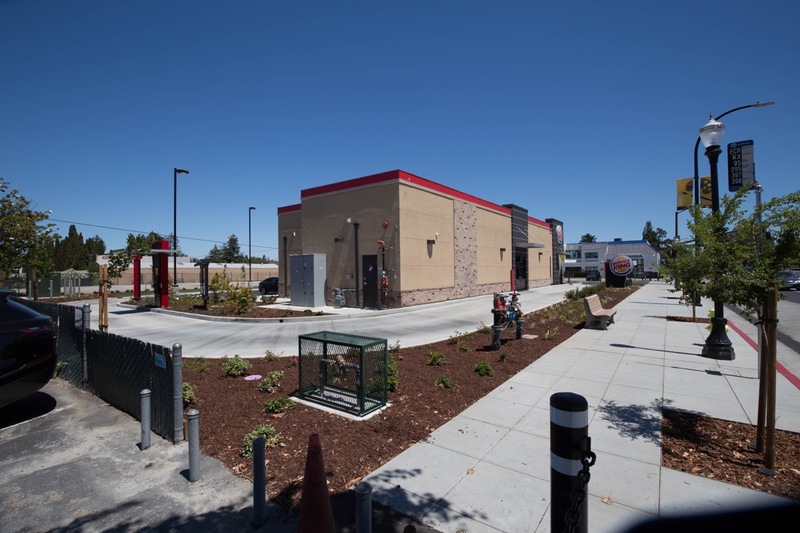 Now, the drive-thru seems wider and appears to be much easier to navigate with a vehicle (I have yet to utilize the drive-thru; I’m not big fast-food customer). I did step inside, and although the dining room is significantly smaller than before, it is nicely appointed, with a combination of booths and free-standing tables. 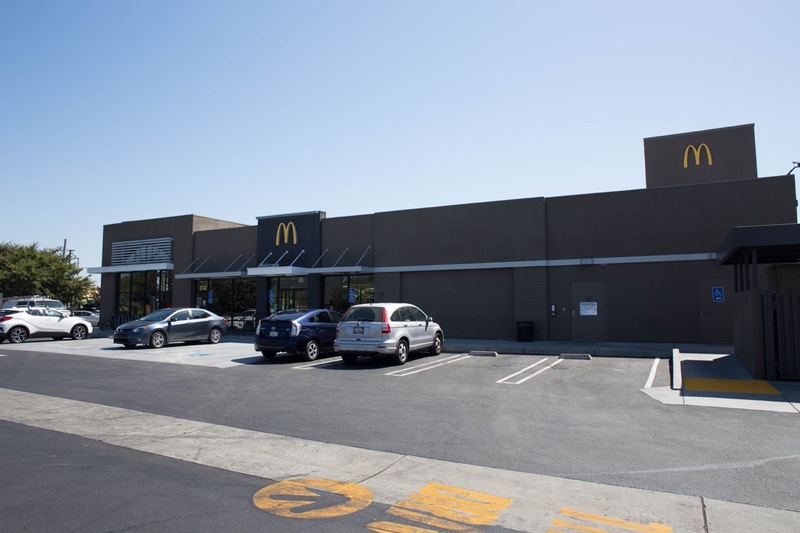 Further evidence that people are increasingly reluctant to get out of their cars comes by way of the recent remodel of the Redwood City McDonald’s restaurant at the corner of Chestnut Street and Main Street. The most striking aspect of the McDonald’s remodel is the new color: where the exterior used to be white with yellow trim, now the building sports a sort of mud-brown color with white trim. I haven’t noticed whether these are new corporate colors or whether this is simply a new color scheme for this one restaurant, but I have to say I’m not a huge fan. It certainly has a more modern, industrial look. Unlike with our Burger King, I don’t believe that the McDonald’s building itself changed all that much. I’m pretty sure that this McDonald’s restaurant remained open during the entirety of their remodel, unlike the Burger King. The transformation doesn’t appear to have involved many, if any, structural changes: the kitchen, dining area, and indoor kids play-area seem pretty much as they were. However, there were two rather interesting changes, both of which are aimed at streamlining the ordering process. First off, McDonald’s is shifting away from having you order at the counter, in favor of having you place your order using large touch-screen kiosks. They still have at least one register at the counter for those who are not interested in the new technology, and possibly for those who want to pay with cash (at first glance it appears that the kiosks only accept credit cards and, likely, payments via smartphone). 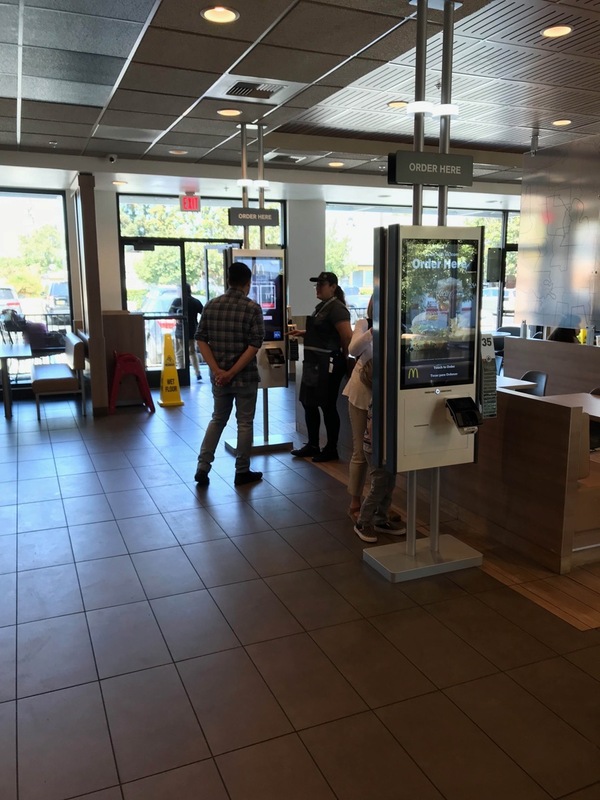 But they are encouraging people to order via their giant screens, even to the point of posting an employee next to the kiosks to explain the process and help people place their orders. The second big change is to the McDonald’s drive-thru. Previously there was a single lane that almost always appeared to have a long line of cars in it. Now, there are two separate drive-thru lanes that merge into one after you have placed your order. This allows McDonald’s to process orders twice as quickly. Since the two lanes merge, presumably ordering has been the bottleneck in the past, and not the actual order assembly and delivery process. I’ve read that McDonald’s has been experiencing some challenges in their business, but I am sure that the degree to which a given store experiences those challenges varies. 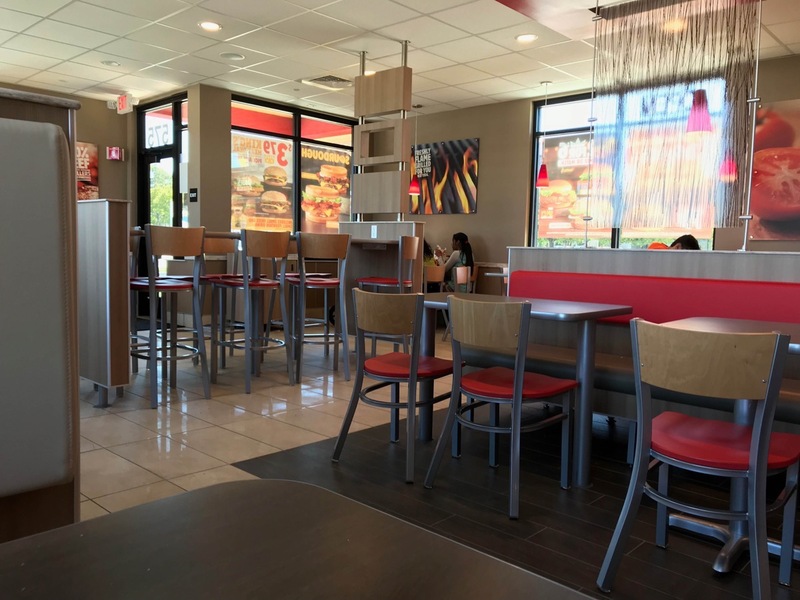 To me this particular remodel is a sign that this location’s drive-thru has been a bottleneck in the past, and that by improving the traffic flow McDonald’s feels that this store will do more business. The self-service kiosks inside, of course, appear to be a labor-saving (and thus a cost-saving) move, one that will allow the store to keep fewer employees working the counter. Formerly Caffino, and briefly the subject of much controversy when this was going to be staffed by bikini-clad baristas, the proprietor has changed the dress code and the business is now open. The building has been painted a rather bright pink and the signs have been changed, but otherwise this is still a drive-through espresso place, much as Caffino was. Of course, the servers have likely changed: from my sidewalk vantage point it appeared that the baristas were young women, and all were clad in shorts and midriff-baring shirts. Nothing particularly racy, mind you: the one or two girls I saw outside the building weren’t wearing anything you wouldn’t see just walking around downtown Redwood City on a warm summer’s day. Because I remained on the sidewalk I must admit that I didn’t get an up-close look at any of those employees, but given what I’ve read I’m pretty sure that the dress code, while still undoubtedly offensive to some, isn’t going to be a real problem. Clearly there will be a large class of people who will simply refuse to patronize this business, and that is certainly their right. But when I was there, on a Friday at about 1:30 p.m., there was a steady line of cars. I didn’t stand there and take a survey, but—to no one’s surprise—it appeared that every one of the drivers were men. 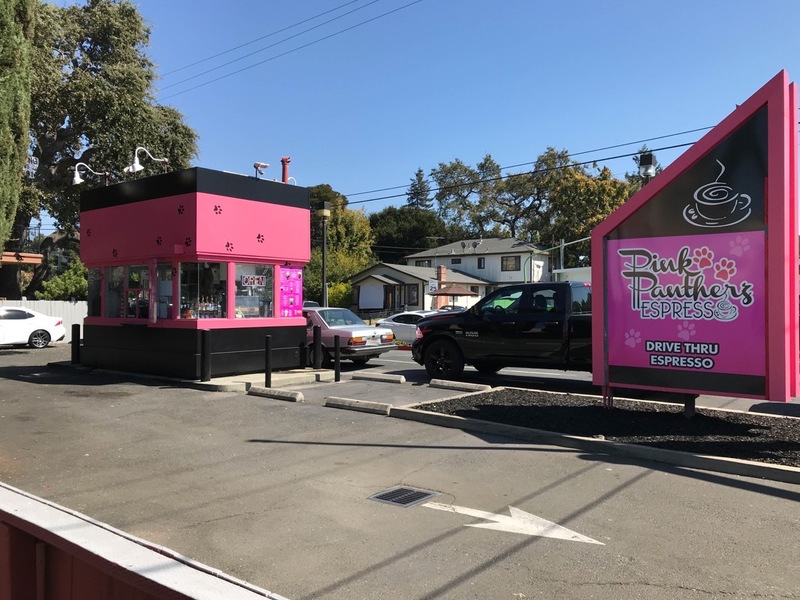 This appears to be Pink Pantherz’s fourth location: they also have stores in Fremont, Modesto, and Fresno. Not being a coffee drinker, myself, I can’t say much about the buying experience or the drinks they serve. But I’ll be keeping an eye on the place, to see if this is just a flash in the pan or whether it has, er, legs. 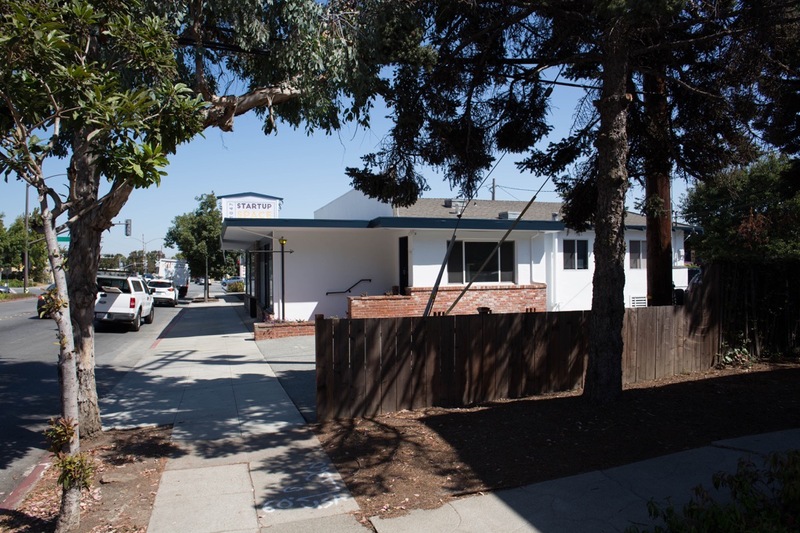 Reader Kris alerted me to the fact that the old Royer Realty office on Whipple Avenue near El Camino Real is being advertised as a “startup space,” and indeed the small building at 1047 Whipple Avenue, along with its neighbor on the corner (the former Village Bottle Shop) are being divided into offices and furnished, and then leased out to small tech startups. Interestingly, you don’t lease the whole space, but instead just pay by the desk: the rate is $500 per desk per month, with the initial lease term being six months. The building facing Whipple Avenue (shown above) appears to be ready to go, and about half of the space is already leased (it has been leased for some time now, I believe, to a company called Metamoto that appears to have built a simulator that can be used to test automated vehicle software). 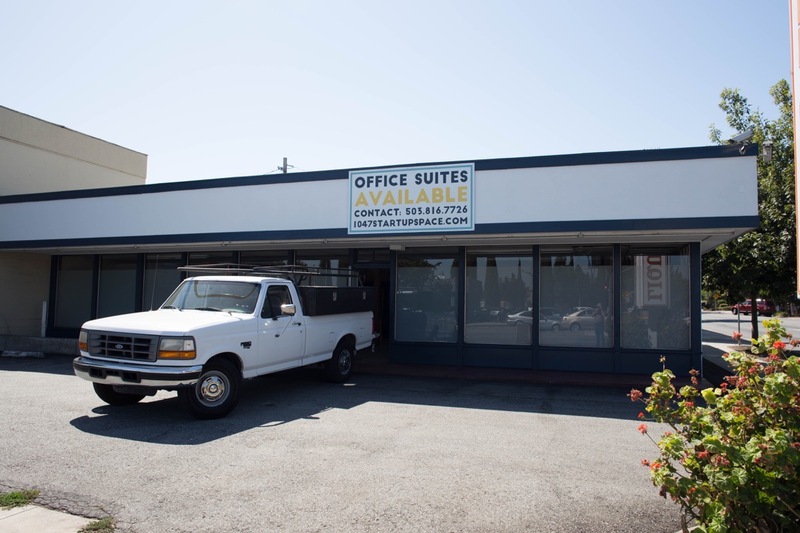 If you are curious, or just want to see how the space has been divided up and furnished, take a look at their online brochure. Both of these buildings, along with the next-door laundry, are owned by the same company, Redside Development. Curiously, some time ago that company submitted plans for a four-story, mixed-use building on this site that would take the place of all three of these buildings. The fact that the two buildings along Whipple Avenue have been refurbished and are being leased out may or may not say anything about the future of that project. Given that the initial leases are only for six months, perhaps Redside Development still hopes to gain approval for their residential/retail/office project, and wants to make productive use of the existing buildings in the mean time. That’d be my guess, but time will tell. Either way, I’ll be watching and I’ll write about whatever eventually happens on this site. I always look forward to your Walking Redwood City emails! thank you for taking the time to provide us with interesting information about our town. Happy Autumn! Former mayor and Congressman Bill Royer worked out of that office at 1047 Whipple for many years. It’s where Bob Hoffman and I interviewed Bill in 2003, and this video underscores his astounding memory (at the age of 83) as he describes the photos and memorabilia which lined his office walls. Great fun, Rene! Bill Royer sure had his memory in tact!! Miss those old timers – Bill and Bob Hoffman! Nice report, objective and relevant. .